Driving around the city and out on the freeway for the last couple weeks has given me some more things to praise the smart on and things that should be mentioned to future owners. There is really no complaints about the car as while the shift delay is there and isn’t going away after just 200 km’s I’m used to it and able to control where/when it has the shift delay but I still wish it would go away completely. Something that I should mention to people buying the new 451 is that you will notice a burning smell coming from the intake vent and from the rear of the car. This for my car was really strong for the first week but has almost completely disappeared now. So don’t worry your car isn’t burning its just cooking off the residue that’s left on the engine during production. Something that I didn’t notice at first but one of the mechanics at the smart dealership pointed out is the needle on the speedo actually drops down and out of view when you turn the car off. This gives a really clean and professional look to the speedo as it means when you turn the car on you see the speedo come to life. It has gotten very cold here in Canada often minus 5 or below so I’ve had the chance to put the car’s heater and heating seats to test. The heater on the car can get warm within 3 minutes but within the first minute you’ll be nice and warm thanks to the heated seats. The seats warm up really quickly and on the full setting, so much that it is actually hard to keep it on the full setting. Every morning I have to cross a very high and long bridge that has major crosswinds and while the smart does move around a little nothing that makes it hard to drive. The real issue in terms of floating around is doing 120+ on the freeways as while it has enough power to get there the power steering is a little effective for my liking. At high speeds the steering movements become far too easy and it feels like if you let the wheel go it would just spin around in a circle. Maybe I can remove the power steering belt, but judging by the manual it’s on a serpentine belt. I do have the upgraded stereo package which does have a sub under the drivers seat but you’d never notice it and its at a point when I do some of my work on the car next weekend I’m going to remove the seat and see if its actually connected. Oh I’m also removing the seat as I dropped an SD card down the side of the seat and there is absolutely no way to get it out without actually removing the seat as it is really packed in under the driver’s seat. Something that was a pleasant surprise was the smart alarm system that I opted in for. When I ordered it I knew nothing about what it would be, didn’t even know the price. But the price was cheap $210, which is cheaper then I paid for the brabus pedals and well worth the money. The alarm system has your standard if someone opens the door or trunk it will go off but the part that really shocked me was it has a motion senor for the interior. This means if you happen to leave your window down on a hot day and leave someone on the seat or in the glove box they’re somewhat safer as if someone puts their hand in the window the alarm goes off. In my test I put my hand in about 4 inches and the alarm went off, so it is nicely sensitive. This should also mean that if someone breaks the glass the alarm would go off, but I don’t know and not going to test that out. I’ve done 300km on the car and I’m still on my first tank of gas, so no idea what the gas mileage will be but its far better then my old X5 and I’m sure that I’m not going to take $100 to fill the tank as it did on my X5. I really didn’t buy the car for ultra low gas mileage so I’m happy with what ever results I get and won’t be meticulously keeping track of my mileage. 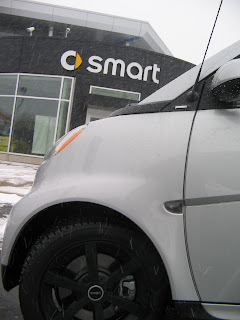 The best part of my smart is that it’s my smart, I’ve wanted one for so many years that like a new born baby its perfect even with the little imperfections it has. I really think I made the right choice with silver on silver as it’s the most neutral yet sport design but I will probably end up buying a yellow panel set to bring some color to the smart once and awhile. The other color combination that I really like is black on black as it makes everything match so well and if it wasn’t so hard to keep clean I’d probably think about buying a black on black, but if you like to wash you car then I’d say black on black is a really great color combination. Nice write-up. I'll be following your progres. In regard to the part about the burning smell: My 451's engine always smells like cinnamon after a long drive. Isn't that weird?